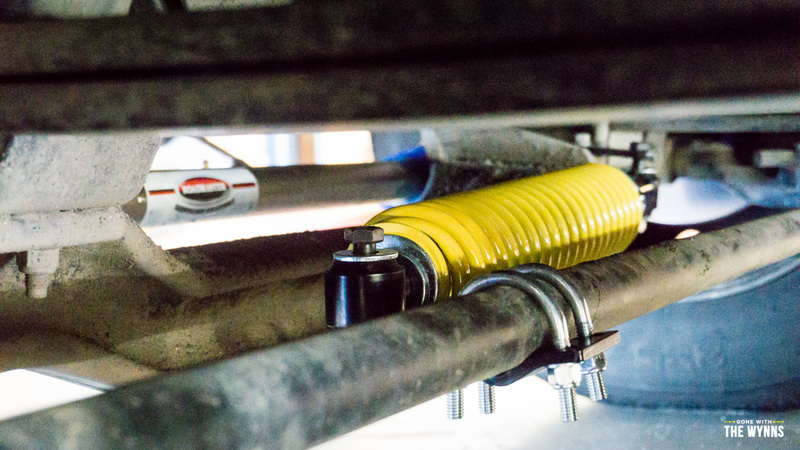 When it came to RV suspension and ride upgrades, lets just say we were skeptical. We’ve been sold “snake oil” many times in our lives and we just assumed all the suspension upgrades out there would be expensive, take loads of time to install and worse of all they’d provide little to no ride improvement. We assumed that Ford built these chassis for Gas RVs and they would have put a lot of R&D into the process…turns out we were completely wrong! We had so many questions on these RV stabilizing products we thought we may as well make a video and do our best to share our experiences along with the answers we found. Front Sway Bar 1139-140 – The install on our coach was extremely simple and took only 30 minutes, I watched the entire thing and it’s something anyone can do themselves (and that’s saying a lot if you’ve seen my How Not To Videos). 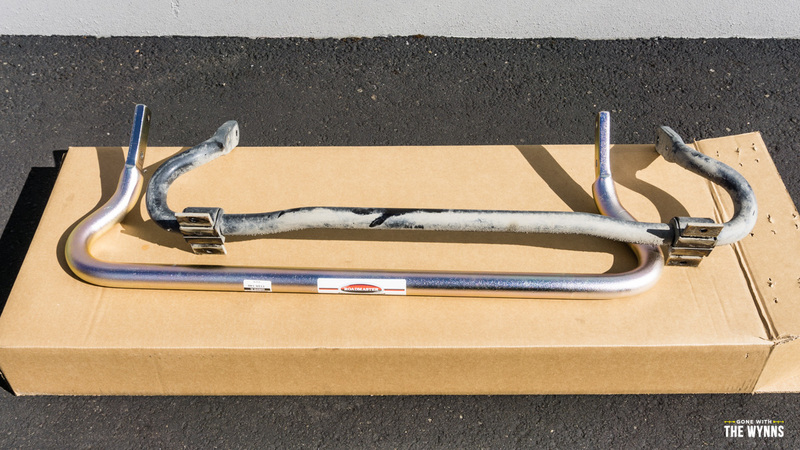 Rear Sway Bar 1139-145 – The install was a bit more difficult because the rear of the RV needed to be raised up and the mounting bracket locations were a little snug for larger fingers. Even still our tech completed this in about an hour. If you’re decent with a screw gun you can most likely do it yourself. Reflex Steering Stabilizer Class A “RSSA” – The install is easy with one large caveat: You MUST have the steering wheel and front wheels pointed perfectly straight. The tech took about 20 minutes to install ours ad it was just tightening down a few bolts, so totally doable. RSSA Bracket Kit RBK9 – The bracket kit is ordered separately from the RSSA so make sure you order the correct one for your motorhome. The RBK9 fits our 2016 Ford F-53 Class A Motorhome Chassis (and most F-53 Chassis since 2000). What do these RV Suspension upgrades do? Sway Bars – Less body roll! Helps keep the RV centered when trucks are passing, in high winds, over bumps, uneven lanes, turning body roll, etc. Generally speaking the Anti-Sway Bars make the RV drive more solid like a car instead of bouncing all around like a boat. We feel less fatigued at the end of a long day of driving because there’s less worry while driving down the road. RSSA – More control in the steering wheel. “Return to Center” is what the mfr claims and it does exactly that. When I turn the steering wheel it returns to center more quickly. While driving down the road there is no “wonder” as in we aren’t constantly worrying about staying inside our lane (this should be pretty obvious in the video as Nikki is talking with her hands while traveling at 50mph!). Also helps keep the coach driving straight with bumpy roads, pot holes and roads with uneven lanes/shoulders. This was an add-on that I wasn’t sure about, but now after logging a few hundred miles this little suspension upgrade is huge in terms of driving performance! Of course it varies depending on the model year and chassis, but our total shop time for all 3 products was 3.5 hours (even though our tech completed it more quickly this is the going rate and should be approximately what to expect at most service centers). The cost of these 4 products from the Roadmaster factory is: $2,102.70 including sales tax. The hourly rate at the factory is $100/hr and so our install cost was $350. Add all this up and we’re sitting right at $2,452.70. Yes its fairly pricey but the difference in ride comfort and safety is so great I think it’s 100% worth the investment, not to mention it gives you a more ‘diesel like’ ride but still keeps you way under that diesel coach costs. We arrived on a Sunday, installed on Monday and they let us stay for an extra day to explore Portland, so if you consider the nearby parks are $40/night it’s like we got 3 nights for free, that’s a $120 discount…at least that’s the way I like to look at it. I do think you can install most of the items yourself and purchase on Amazon to save a few hundred bucks. If you’re heading south then wait till you get to Oregon and order there, you’ll save sales tax and if you’re an Amazon Prime member you can get free shipping too! What if I’m on a tighter budget? I was told by the installer that our F-53 RV chassis is an easy one to install all these items without having to drill or contort your body in crazy ways. If you have the same chassis there’s a good chance you can install everything yourself in less than a day with little more than a screw gun, ratchet set and some wrenches. Do the RV suspension upgrades really work? We were total skeptics on all this aftermarket stuff, but seriously it’s made a BIG difference in our ride. Even the little 2 mile test drive route around the Roadmaster factory was leaps and bounds beyond the original Ford motorhome suspension. I was kicking myself for not having one of those little bubble compass with the ‘yaw’ line to show the sway of the coach, seriously it would have blown your mind the amount of sway we got from the factory vs. how our coach handles now with these few anti-sway & suspension upgrades. Do I need to upgrade the shocks? Many people recommended we replace the shocks on our RV but this would come at a great expense not only in products but in installation time. Ford uses pretty high quality gas pressurized 1.63 Bilstein shock absorbers, so considering our motorhome is brand new I’m not willing to attempt replacing the shocks. I asked the installer his opinions and he said the shocks aren’t the problem with the ride, the problem is mostly the sway which they’ve fixed with the anti-sway stabilizers. What about suspension upgrades for a diesel RV or a Class C? Apparently there are similar products for class C motorhomes, certain diesel motorhomes, Super C’s and most Gas RV models (the tech said if you’re in a Freightliner Chassis RV you probably won’t need any of these stabilizers). Before ordering anything make sure you call Roadmaster, they have a dedicated support staff that knows the products inside and out…and once you get the proper part numbers then you can order from anywhere you’d like. Have you installed any upgrades on your RV that have drastically changed your ride? Got any tricks of your own that we didn’t touch on?  Please share in the comments below, your experiences can help other travelers out there struggling with the same issues who are looking for help…now that’s good karma! Disclaimer – Fleetwood owns our test RV and it is a temporary lease to us, so there is absolutely no benefit for us to install these items other than for testing purposes. We were not paid or compensated by anyone for this article and these products were installed at no charge to Fleetwood. 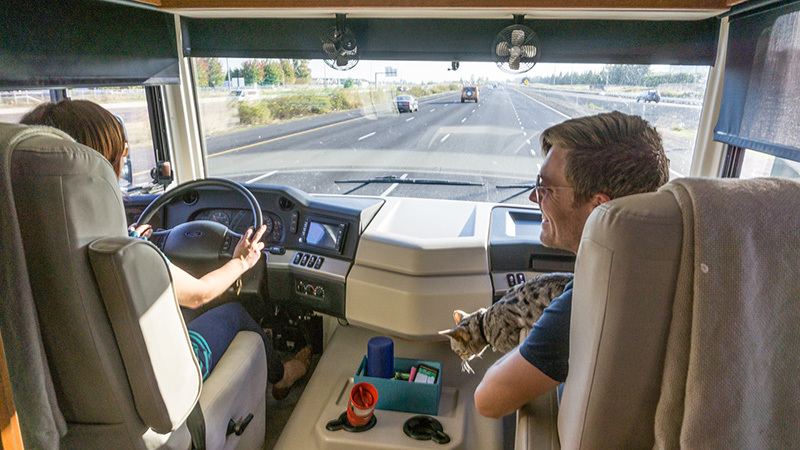 We have done this solely for the purpose of testing and reporting our experience to our readers, and honestly we felt bad about our initial poor experience video and we wanted to find a way to remedy these Gas Motorhome issues for fellow RVers. We chose Roadmaster because it was convenient and we’ve been happy with our other purchases from them. There may be other brands out there but we do not have experience with them and we cannot comment on their quality, warranty or effectiveness.  If you’ve found this info helpful, the links to products are Amazon links and we receive a small commission if you click from our site and order within 24 hours. Thanks for being a part of the adventure. I just wanted to say thanks for your helpful information and videos. I have only recently begun to check them out and I like and appreciate what you are doing. Two years ago I went from a pop-up to a class A. Quite a jump! I especially appreciate it because, unlike many of your readers, I have to make the best of what I have. I bought my 1999 Bounder 34J two years ago for the price of a good used car. It was extremely well cared for by the previous owner. My point is, unless I win the lottery, this is the only motorhome I will ever own. Sure, I dream about having a new DP but I know I can’t afford to maintain one, much less buy one! These are all reasons why I appreciate what you’re doing. The suspension thread is helpful and confirms what I thought the problem was. Please keep up the good work and happy camping! We purchased a 2013 Itasca 27N during the spring of 2018. Only 27k miles and pristine inside, well maintained. Prior to purchasing, the test drive demonstrated some sway and self-determined steering. I thought that was just the way it was. We purchased the rig and drove it home to begin the learning curve. Took it out for a shakedown cruise the next day. White knuckles describes the trip. Upon return, I started to research the RV. Came across the F53 Chassis warnings about the rear sway bars coming loose and breaking brackets. Sure enough I can confirm this happened to ours. The passenger side mounting bracket was gone, one tab still bolted in place remained, and the rubber bushing was down the sway-bar arm. Great! I searched and bought a kit to replace the brackets and bushings on the sway-bar. The F53 chassis still rolled with the punches and was pushed around by passing vehicles. Still a white-knuckle experience. I came across your Roadmaster YouTube visit. Sounded too good to be true. Based against the reality of having a wreck, we elected to make an appointment at Roadmaster and got the same updates as per your video. I strongly concur that this is money well spent. It is a decision that you can live with. Night-and-day difference in handling. Down to Roadmaster on I-84, from Walla Walla, we experienced white-knuckles, wind, and the air from passing vehicles pushing us from our lane. Our speed was about 55 to maintain some lane control. After the same updates as the Wynn’s, front and rear sway-bars and steering stabilizer. Our speed was 65-70 headed home. The wind and passing vehicle influence was very much abated. Well worth the purchase. It is nice to drive the unit now and retain normal knuckle coloration. You are worth the expense of doing these updates. 2017 Forest River 31B3…..So far I have installed the roadmaster rear sway bar and the RSSA steering stabilizer as well as performing the CHF on the front. I have not driven it since the rear bar was installed and am hoping for a silver bullet. The 2 trips I have driven have only been for about 170 miles each way and I am truly exhausted when I stop. Hoping for a change soon. The front roadmaster is a little less expensive so will be trying that next. This is too funny. Just coincidence maybe. My hubby returned to our RV Dealer about 8 weeks after our purchase to have them fix and tweak minor problems we noticed on our two initial trips out. Adjusting the slides, buttons and lights, etc. So while he was spending hours at the dealer’s service area he had the opportunity to chat with several owners & techs. He mentioned being white knuckled driving in heavy Altlanta traffic. He mentioned the unpleasant sensations of being blown by heavy wind, semis passing us and rolling after turns. They made driving miserable at times. They suggested these Roadmaster anti sway bars and steering assist which he added as soon as Amazon Prime delivered the parts. And we agree with you. The ride is much improved, very stable, much more enjoyable for the driver and passengers. No more white knuckle driving!!!! Incredible! We saved quite a bit on the labor, as he was able to do it all with a little help from Youtube and a neighbor who helped hold up the weight. Thank you for passing this on. We highly recommend this upgrade. Our 2018 Jayco Class A Alante is now a team to handle for its lifetime. Right, it is AMAZING the difference. People don’t believe me at first, but then they add the upgrades and it’s as different as night and day. Thanks for sharing. I just installed sumo springs, an airless air bag with 0 maintenance. Cost about $1000 for all 4 and installed them myself. Stopped the sway instantly. So is this an alternative to the Wynn’s upgrades? I was considering the Wynn’s upgrades along with the sump springs airless air bags. Overkill or I’m I confused on the product(s) intended purpose? I have a Class C. It’s a 2012 Winnebago Access 31C. I recently added Hellwig antisway bars front and back and Biltstein heavy duty shocks. I also had the caster set at +5 degrees. The difference in handling is amazing. Prior to the upgrades, there was ~1″ of play in the steering wheel. This caused some white knuckling when trucks past. After the mods, there is zero play in the steering. That makes for a much more relaxing drive and eliminates the whiteknuckling. If you haven’t done the upgrades, you know what I’m talking about. Wow! We have all the same issues, which does make it a harrowing ride! Although we have a much older and Chevy chassis, we are definitely going to use your info to see if it can work for us! Thanks so much for your video! It was amazing! Our new 2017 Holiday Rambler Vacationer suffered the sway and especially when a tractor trailer was passing on the interstate. Your article inspired me and I started looking into changing the sway bars but in the middle of my research I received an email from the manufacturer that the bushings on my rear sway bar needed replaced. I don’t remember right now why but made the appointment with my dealer (Giant Recreation World, Ormond Beach, FL). Prior to the work being done I spoke with the service manager about simply replacing the sway bar but he said to drive it with the new bushings first. I watched the mechanic remove the old U bolts and install the new heavier duty longer ones with the new bushings and drove it back to my storage facility without giving it a second thought, a four lane straight road with minimal traffic. We didn’t use the motorhome or a couple of months and then took it to the mountains in N Georgia with a car on a tow dolly. The first 150 miles of Interstate were in a monsoon, the remaining 300 miles on 98% Interstate including the perimeter around Atlanta, heavy traffic. The act of simply replacing the bushings was nothing short of a miracle when it came to handling. Passing or being passed by the tractor trailers was no longer “exciting” or scary. Going into the curves on the road no longer gave the feeling of being overly top heavy and the ride, although long and tiring, went just fine. The trip up included Interstates, narrow mountain roads and severe weather. The bushings made all the difference and I’m not concerned about replacing the sway bar. Just something to think about. I do have experience driving trucks and fire equipment. Both of you are to be thanked for the straight forward honesty that you don’t hesitate to give and not sugar coating your reports and opinions. The thing now is to install Sumo Springs. These help sway as well as porpoising and generally smooth out the ride. They help both the shocks and the sway bars do a better job. Tiffin has them as an option now and will factory install. But you can order them and install them on an old coach too. One thing people ordering a new coach should consider – upgrading the chassis. Often, for just a few thousand dollars, you can upgrade from a 22,000 lbs chassis to a 24,000 lb chassis, or go from a 24,000 to a 26,000. This not only gets you more payload, but bigger sway bars, heavier springs and bigger tires. All these help the handling. This may be a “secret” option not listed on order sheets, so you may need to call the factory for details. Our ride use to be very quiet. We had to add a steering stabilizer bar and now it is very loud. Just a bass sound really but much louder. Does anyone know how to reduce that noise? Really enjoyed seeing how much improvement can be made at not too high a cost. I was wondering, however, if making these upgrades on a new rv would affect the motorhome warranty in any way? We are looking at upgrading in the next year, and I think we would do those upgrades immediately if it wouldn’t void any warranty. Really enjoying your adventures and the videos will help us transition from travel trailer to motorhome. Thanks! Awesome review and sooooo timely. I’ve been fighting my Ford 53 chassis now for many, many months and, NOW, convinced, thank you Nikki, that I’m truly not going bonkers. I’ve been fight this thing for 2 years….almost to the point of giving up and trading it in. We have a 2005 Tiffin Ford 53 chassis motorhome. We truly love him (SeeMore) and were convinced that there was a fix somewhere. We’ve looked high and low without any success until this vid. I would say…I’m the only driver…”Don’t you feel that?”….I mean what is wrong with this picture. Anyway….the floaty thing did it…I watched the vid and heard all I needed to, to know that we were on the same track. I’ve checked RVSERVICEREVEIWS.COM to find a service person in Mesa, AZ that will put on MOST of what you recommended. Thank you so much….I always wondered why our gaser didn’t drive like a diesel…now we know!! Thanks for your post. We just traded in our Jayco 5th wheel for a 2016 Jayco Alante 26x that is on the F53 Chassis also. Driving it home about 1.5 hours was horrible. It took everything I had to keep it on the road and I have driven many types of big trucks in the Army. My wife was getting sick and couldn’t wait until we could pull over. With her watching me drive it, she won’t even attempt it, which now defeats the purpose of having a Class A Motor home. The product knowledge of the outfit I bought it from is really poor since the Alante’s are so new. The dealership said they are going to make it right and they are going to check with Jayco Corporate to determine what can be done to make this thing more enjoyable to drive. I went to test drive another Class C and Class A (after the purchase of this one) which was a Jayco Precept and I had this thing up to 70 and was driving one handed. How can one year difference in the Ford F53 make such a difference in handling. I have to find out what the 2015 Precept has and what mine doesn’t. Attempting to drop it back off at the dealership, the 300 miles I put on it was now going to cost me 10k (in the buyback) and I simply can’t take it in the shorts that bad. I really need to know what is necessary (from an equipment perspective) and what I can move onto my next Class A in a few years when we upgrade. I don’t believe my unit comes stock with the Bilstein Shocks like it does on the Precept. I noticed that you’re post didn’t say anything about the “Steer Safe” or the ” Safe-T-Plus”. I thought for sure, I’d need one of those. Thanks for the info, I do appreciate it. Can you do a show just about your kitty cat??? Thanks for the reply. I watched more of your video’s last night. I will admit your perkiness is pleasant and maybe some will rub off on me. lol. I appreciate your reponse and I know its not T&A but you will have to admit probably one of the reaons you are succeesfull is that you are both attractive, I dont see too many video’s with the stereotypical RV’er. Just wanted to bust on you two. Have fun, stay safe (you dont mention anything about safety precautions on your videos) and I hope you can keep on doing what you are doing for as long as you can. The one RV video where your wife was alone in Joshua tree for the night had me a bit worried. I know you love your cats but maybe someday maybe consider a big dog! Take care and again thanks for the response. Your wife is hot, more shots of her on the sailboat in a bikini would be nice. But seriously, well I am serious, I would tone down the enthusiasm, just a little too much and comes across a bit fake. No couple is that happy all the time. Throw in some arguments here and there. Other than those two suggestions I love both your RV and Sailboat videos. Got addicted and stayed up one night and watched 10 plus in row. It was good to hear your thoughts on these three upgrades. Did you do any comparison with the BlueOx stabilizers and steering centerer? And if you did what made you choose the Road Master components? We just installed the Roadmaster steering stablizer and a new sway bar. We didn’t go with Roadmastet sway bar, but opted for a Blue Ox instead. Took her out for a test drive today and were amazed at the difference! The body roll was greatly improved and we no longer feel like we’re fighting for control. Great suggestion. Your videos gave us the proof that we needed to pull the trigger and spend the money. Our Christmas trip is going to be a brand new experience for us. Thank you! Safe travels and Merry Christmas. Hey, thanks so much for sharing! Comments like this make us smile ear to ear, safe travels and happy holidays! Thanks for all the great insights you provide with your site and videos. Just drove our Winnebago 27N back after completing the Roadmaster upgrades and its a completely different coach now. The improvements are as dramatic as others have stated. Isn’t it amazing? Thanks for taking the time to share. You are correct about the difference in the bouncing of the front end. The heavier stabilizers dampen the verticle response of the vehicle besides the horizontal movement. This translates into a smoother ride and more stability and control. Thanks for your video from ROADMASTER. I talked with the factory and ordered the kits. Installed them myself with the help of a friend. One full day, no major issues. Took a trip the next day and the coach’s ride was FANTASTIC and GREATLY improved. Completely satisfied and would recommend products. No stress or fatigue on me. We have a Fleetwood, Fiesta, 36T with a Chevy Workhorse (W22) chassis. Install with no major issues…you’re a better installer than I. So happy it worked out, we’re still amazed by it, in fact we drove the PCH (CA Highway 1) and I can’t imagine attempting this without the extra stabilizers. I just did the same three upgrades and the difference in the ride is amazing. There is no more tilting from side to side and even the bumps in the road don’t seem as bad. I have a 38 foot Winnebago Sightseer and it drives more like a pickup now instead of a box on wheels. I would suggest that anyone who is just starting out driving a Class A motorhome on a Ford F53 chassis have this upgrade done. I would argue it is much a matter of safety as comfort. The difference in the control of the RV is very evident. When I talked to the folks at RoadMaster, I let them know I saw the info on your blog hoping to get you some more press. Unfortunately, the clerk was not aware of you guys. I bought the parts at etrailer,com and it was less expensive than anywhere else I found. Also, they shipped everything the next day, with free shipping. Roadmaster was out of stock and were backordered 30 days. We started full-timing a few months ago and are loving it. Your blog and videos are very helpful and I enjoy the perspective that each of you have. Keep up the great work and have fun. I know you will. That’s great to hear Kerry and thanks for coming back to share your experience! Oh, and welcome to the world of full time RV’ing! Thanks for the great Blog. Great article on how the add on suspension pieces you added benefitted you. In doing some research on the 2015 F53 I found that the chassis you and I share has a self centering devise built in. Do you think the chassi•Reflex Steering Stabilizer Class A “RSSA”s you installed is redundant or necessary. Thanks for the advise to go with the extra rear sway bar first. The only down side to your blog is your costing me money with all the great places and things your doing. LOL Keep up the great work. Happy to help and sorry for the extra expenses 🙂 I do feel the RSSA has helped quite a bit, but I’d say go for the Rear Sway bar first and see what happens from there! Good luck! I have a 2015 Coachmen 36′ and it has the V10 Ford motor as well. I have found the noise level, shifting, etc is dependent on how I drive it! I don’t press the gas hard just let it shift on it’s normal cycle without stressing it and the noise is greatly less and runs smoother. My dog house has carpet over and around the driver and passenger area and that reduces noise greatly I am sure. We really do not notice dog house noise much at all. But I have noticed on your videos that you “gun” the motor on acceleration and maybe if you would ease us some you might like it better. I can get great acceleration by just driving the Coachmen a little gentler! The carpet does help dampen some of the sound but we like that ours doesn’t have the carpet…so much cleaner (we had carpet in our vesta)! As for gunning the motor, we only did that for demonstration purposes but honestly, going up hills, it happens no matter how gentle we are. I have a 2015 Coachmen 36′ and it has the V10 Ford motor as well. I have found the notice leave, shifting, etc is dependent on how I drive it! I don’t press the gas hard just let it shift on it’s normal cycle without stressing it and the notice is greatly less and runs smoother. My dog house has carpet over and around the driver and passenger area and that reduces notice greatly I am sure. We really do not notice dog house noise much at all. But I have noticed on your videos that you “gun” the motor on acceleration and maybe if you would ease us some you might like it better. I can get great acceleration by just driving the Coachmen a little gentler! Hi Deborah, The diesel they are talking about is a diesel pusher motorhome. Your Siesta on the Sprinter chassis would be the same as a front engine gas RV. Diesel pushers usually have an air ride suspension, and very good sway bars. They are also a lot heavier so bumps and wind do not affect them as much. Great information on the suspension upgrades. I have a 2015 Bounder and was looking to make improvements, so your report was exactly what I needed. I ordered the sway bars and installed them myself. Managed with hand tools and the coach on the ground. Definitely need a fairly long breaker bar for the really tight bolts- and getting them good and tight when put back on. The handling improvement is certainly noticeable and makes driving much more comfortable. I also noticed there is less movement when going up the steps. Decided to hold off on the steering stabilizer as I’m pretty happy with stock. Next to try will be the much talked about 5 Star tune- I’m hoping you guys give that a try. Looks very easy to do and seems to have great reviews. Thanks again for all the great videos! Great article and video. We’ve been hearing a lot about these and wondering which way to go. We have decided to try the “cheap handling fix” which works on the F53 chassis. We have a 29′ Newmar Bay Star with the same 22k lb chassis that your Fleetwood has so I’d be curious about the difference between aftermarket sway bars and simply making adjustments to the current sway bars via the “fix”. Cheers and we’ll certainly use your Amazon link if we decided to get anything! Love taking a ride with you guys! Regarding upgrades, kinda makes you wonder why they do not build the improvements in the first place? It’s been a good experiment – but I’d guess your ready to head back to a DP RV. Maybe your following is big enough for a new sponsor to up the ante for the next RV??? I know the Alaska trip has buried you guys in footage and finding the time to produce it all into how-many-dozen videos is super time consuming. I’m sure you feel it, but you almost need a production crew. You travel and shoot – someone else puts it all together. Hello, Discover Channel? One last comment – it would be great if you had a Forum on your website. That way all the members can talk about these issues. It’s super easy. I run a number of them and have contacts that run some of the largest RV forums. Contact me if you want more info. Bounder – We like that we have the opportunity to test this Gas powered coach. We like the layout of this RV best, better than any of our other RVs. Sponsor – We don’t have an RV sponsor, we pay for a lease on this RV as we did with the previous RV. Class A – We have never considered anything else as we feel it’s the best for our type of travel. Editing Video – We would love to pawn off our video to an editor but it’s simply not in the budget. Forum – We tossed around the idea of a forum but decided against it a few years back. We prefer the more personal “comment” style. Just a point of clarification – you crossed the Columbia river (not Hood River) when you were headed south on 205 out of Vancouver, Washington. We are Portlanders and just bought our 1st RV this past summer – Fleetwood Discovery 37 (Yes, we went Diesel Pusher). Love it. And watched many of your videos when we were evaluating models and shopping this past summer. Thanks for this Great Blog! Yea, when we crossed I was thinking about Mt. Hood and one of our favorite towns of Hood River just up the gorge…oh well, I realized after the video went live and once that happens there’s no going back. Congrats on the new RV, hope you enjoy it. Great information and another awesome video. We are on our 3 RV in 4 years and we are currently enjoying our Itasca Sunova 33c and we got buffeted by the winds throughout our Maritime trip. We have the same chassis and I’m looking forward to finding a truck shop along our route to Florida to get the sway bars and stabilizers installed so that we can better enjoy the ride. I’m quite pleased with the gas coach vs the previous diesel. Any product tests on GPS units in the future? Again, thanks for very informative (and entertaining) videos! Happy to help guys, I’m sure you’ll find plenty of locations in FL willing to install the stabilizers. Have they finished the Dog House insulation package yet? Waiting to here how that came out. I assume that you don’t have a sound level meter to do a before and after measurement. I truly enjoy all of your videos and tips. Can anybody recommend a shop in the Houston, TX area that can advise me of steering improvements to my coach. I have a 2015 Newmar 3401 Bay Star and at times she drives like a beast. Every time an 18 wheeler passes I get pushed around. Thanks and I hope somebody knows of a shop in my area. Yes, and make sure you call Roadmaster direct to confirm the part numbers, do not trust a dealer to get it right! Reading your blogs and watching your videos have helped me alot on deciding on a used coach. I got a 2001 Bounder 36u with the V10 on the F53 Chasis and we love it. What are the recomended upgrades for drivability? We are in Maryland and do alot of weekend trips to VA, PA and Delaware which involve alot of crowded highway driving and alot of inclines. I am a advid do it youeself kind of person and a big fan and sympathizer on your “How Not to” videos and wanted to get your advice on upgrades. I just read your post (haven’t watched the video yet) and I thought that this would come up. Ford makes stock chassis and sells them to the RV mfgrs. They are bare bones and the RV companies with the exception of Jayco don’t do too much to improve the ride. We bought our 02 Damon Intruder last year and after one short trip and rubberized arms we started the upgrade process. We added a 1 1/2 in rear auxiliary stabilizer bar in addition to the rear bar that came with the chassis. We installed 4 new Koni shocks. We added Safe-T-Steer stabilizer. The last mod was the installation of Sumo Springs up front. The difference in the ride was like night and day. While I can’t say that the ride is like that of a diesel class A, I can say that the changes made for a far more comfortable ride both in the arms and in the seat. The cost of the upgrades was significant as they were done in the SF bay area since the labor rates are slightly higher here. I used to do these things myself but no more for a number of reasons. Since the initial cost to buy the coach was very budget friendly and it only had 24k miles on it the changes worth the cost. Bottom line is that we can now full time in it very comfortably when the time comes. Another great job guys! When I first started researching gas RVs I was shocked to find out that manufacturers make no effort to improve the Ford F53 chassis. As others have mentioned Tiffin started offering SumoSprings as an option in 2015. Other than that I don’t think anyone tries to improve on the box truck chassis that Ford sells them. We have a 2014 Tiffin Allegro 36LA which has a similar layout to your Bounder (other than the bathroom). We love the L-shaped sofa and the TV fireplace combination right in from of the sofa. When I drove the Tiffin home 2 hours from the dealer I realized that the ride and handling left a lot to be desired. It was borderline scary. I still remember going through my first toll booth. I spent several days researching suspension upgrades on the forums. Before I drove it again I installed a rear track bar from Brazel and a Roadmaster steering stabilizer. I also reduced the tire pressure from the 110psi from the dealer to 90 in front and 85 in back. These changes made a huge difference. The coach was much more drivable and more stable going down the road. These were not difficult to DIY but be aware that for the track bar you will likely need an impact wrench. I used a Ryobi cordless from Home Depot and it was perfect for the job. After nearly 14,000 miles I am still planning a few upgrades to the running gear. Next will be SumoSprings Maxims. These are closed cell foam springs, replacing the bump stops, that offer progressive resistance both up and down as they are compressed and released. The end result is supposed to be similar to sway bars in that they offer increased roll resistance. The difference is that sway bars only reduce side to side sway. SumoSprings should also help control longitudinal bobbing to some degree. Reviews on the forums are universally positive. Many users report an improvement in ride harshness in addition to the handling upgrade. Others cannot tell any difference in the ride. After I do the SumoSprings if I feel the ride still is too harsh then I will try Koni FSD shocks. Many people claim a noticeable difference in the level of harshness after replacing the Bilsteins with the Konis. Supposedly the gas-charged Bilsteins offer much more initial resistance when compressed than the hydraulic Konis which are stiff in rebound but softer in compression. This should reduce harshness over bumps. We shall see. The only other upgrade to the running gear that I am planning is a 5 Star Tune to improve the transmission shifting and make the cruise control more useable. This is pretty much a no-brainer as reviews on the forums are 100% positive. The only reason I haven’t done this yet is that I don’t think of it unless I am driving the motorhome. Maybe I will do it now since I am thinking about it. Based on your videos I believe that our 36LA is somewhat quieter than your Bounder. I noticed that the Bounder has a taller doghouse than our Tiffin. Maybe Tiffin uses the space for sound insulation? The biggest source of noise that I notice is the the roller shades banging against the window frames. This can be eliminated just by rolling the shades all the way up. We don’t notice any squeaking or rattles in the dash. I am glad that Fleetwood is stepping up with the insulation kit for the Bounder. In comparison to the Tiffin they offer some really nice features such as a much better inverter and a larger water tank. I don’t know what Tiffin was thinking when they decided to put the furnace under the refrigerator in the 36LA. I am short and can barely reach items on the top shelf. I do keep looking at diesel coaches but when I came close to pulling the trigger a few months ago I just couldn’t justify the cost. New our Tiffin was $119,000 out the door. A year later the best trade-in offer I got was $82,000. I was looking to purchase a new 2015 Fleetwood Discovery 40X that was on sale for $189,000. No doubt it was a great deal. I have a chronically sore back and in the end I just couldn’t bend over far enough to do it. Honestly we really like our Tiffin. If I can improve the ride just a little more then maybe I will stop looking at other coaches. Before you spent 2500( or got it free) on all the stuff, did you do the CHF? Not sure what the CHF means. Cheap Handling Fix. On an F53 chassis the front sway bar has two sets of holes in it. to fix the handling all you have to do is move the adjusting bolts from one hole to the other one. I did this on a 2014 Thor Outlaw an it made a world of difference. The back sway bar has the same extra bolts holes in it as well but I have not made the back adjustment yet. I don’t know why the RV Mfg. don’t do this at their factory. There is alot of info on the web about this. The cost is about 45 minutes of your time. I’m researching RV’ing for when I can hit the road full-time in a few years so I read a lot of blogs like yours and pretty much ALL the people I read point out the cheap build quality of their rigs from the cabinets to the sinks and kitchen appliances to the noise coming out of the doghouse to your topic of today of ride quality. And I have to say I am amazed that RV mfrs. don’t automatically include simple and cheap (when done as part of the build process) upgrades to all their rigs which would VASTLY improve customer satisfaction. It’s like mfrs. choose to build everything on the cheap to get you in the door than expect to harvest profits on the back-end in the repair and upgrade cycle. IMHO you guys are doing the RV community a great favor by doing your RV comparisons and evaluations and now by your involvement with Fleetwood as they’re one of the biggest players in the industry and will probably have a bigger more immediate impact on the build quality across all mfrs. So thanks! As a future RV’er my biggest worry is buying a lemon, which it seems up to now is pretty much 100% of all RV’s. Hopefully through efforts such as yours and others (like Technomadia) we can count on the industry FINALLY opening their eyes and figuring out that adding a few thousand bucks cost for better components will pay off with more people being happy with their purchase and encouraging more people to go RV’ing. First, Thankyou for bringing the RV community together. Your videos make purchasing or upgrading so much clearer. Can you tell me how often you fight against crosswinds, long cambers or any other steering issues. I’m trying to decide on safe T plus or roadmaster vs Blue Ox Truecenter … Im not sure how often you would need re centre your steering based on road or wind conditions. Maybe you can help out by telling us your windy or steering adventures. I’m so glad you guys did that upgrade. I’m excited for you. While I did not end up going with Roadmaster, the results after my DIY install were the same…much more relaxing and safer to drive. Hey Nikki…nice to see you behind the wheel. Melissa refuses to drive probably because the only time she did drive was before the anti-sway bar and shocks upgrade. Figures. Maybe after watching this, I can get my wife (Mandi) to drive 🙂 Quick question, does your bounder get good cool down factor in the back bedroom? I notice the rear ac unit is not directly above the bed. We are looking to upgrade to the bounder next year! Thanks! Brent, the rear A/C was one of the initial complaints in the Wynn’s earlier videos on the bounder. I have the exact Bounder as the Wynn’s (2016 35K, on a 2015 Chassis, 5 speed, New ones rolling off the line now are on the 2016 Chassis with the 6 Speed, but in looking on all the dealer sites I still haven’t found one actually out there) Because of Jason’s video it was an area I watched closely in my bounder. I did a trip in late Aug into Sept, I really didn’t notice a real issue with the master bedroom NOT cooling. In fact we had to have a lite blanket because at 72 it was cold. The back will heat up faster than the front going down the road and the Temp Sensor in the back is along way back. Overall the bedroom A/C works fine as the rear unit blower is to all the rear vents. The one issue is the 1/2 bath has no vents in it so it is the only point in the coach that really does not have good air flow from the A/C. Hope this helps some. We have a rear A/C and it is a MUST for any RV over 30′ if you plan to travel in areas where temps reach 85+ degrees. My complaint is there is no vent fan in the bedroom, our Vesta had one and it helped move air and more importantly it served as a “noise machine” when sleeping in loud places. Dennis, thanks for the info! I was in a 35k yesterday and saw that there were 4 ac vents in the bedroom. You would think that would be enough to keep you cool in the summer. We may wait an extra bit of time for the 2017s just to see what improvements there are. If there aren’t significant improvements then we could get a better price on a 2016. Thanks again! With both A/C’s crankin the back bedroom gets plenty cool enough. Having owned a gas class A before purchasing our diesel we felt that these stabilizer upgrades should be part of the original factory package. I think owners of gas RV’s would be much happier with their purchase if the Ford chassis had a more stable ride to begin with. Nice video. At least you took the 205 around Portland instead of going through the heart of town. I drives me crazy every time. Quick question…..What GPS are you using? I liked how it told you about the traffic delay. ha ha, we have the Rand McNally RV GPS (in our shop) and its great but that was actually google (my cell phone) plugged into our speaker. We use both because the RV GPS will avoid bridges and such that are not RV friendly and google gives us traffic updates. We haven’t found one device that does it all yet. I guess I need to try google…..
Is there any special setting you need to do for the traffic reports? Did they even mention Sumo Springs to you?? Tiffin now offers them as a factory option and they are great!! It like Air Bags for Gas RVs! We have that and the Blue Ox Tiger Track on our 2015 Tiffin 36LA and I normally drive with just one hand. None of that white knuckle stuff! My wife drives it regularly and she feels very comfortable driving it! I was glad to see you make the upgrades. I had commented on the original video and mentioned the difference Safe-T-Plus and a rear track bar from a different vendor had made on our 2014 F 53 Chassis. I also mentioned the 5 Star Tune and am glad that you are looking into that. You won’t regret it. I installed it several months ago before a trip into the GA, NC mountains with a toad. I typically drive in “Tow Haul” for the engine braking. I don’t use cruise control as it can still be a downshift issue but otherwise, double downshift going up hills is gone. The the tune will hold overdrive much longer and easily just drop one gear when the accelerator is pressed hard. If you read forums on both IRV2 and Family Motor Coach sites, there are few if any regrets about spending $415 for the tune. Customer Service at 5 Star in NC is very helpful and it is an easy self install. I agree with other comments that is is surprising that Ford has not modified their engine program nor strengthened the front and rear sway bars. The steering stabilizer helps keep the coach straight and may safe your life in a high speed front blowout as it will make it much easier to hold the coach straight when slowing down. Thanks so much Ted, we’ll take this into consideration when researching the engine upgrades. We installed the Safe T Plus ourselves after Camping World put it on backwards. We bought our 33 ft coach used and the previous owner had installed a Roadmaster. We were not too impressed with either. The Roadmaster failed at 50,000 mile and literally grenaded on the road. No one or any other vehicle was damaged but it was horrific seeing that bright yellow spring disappear in the rear view camera…and the sound of the remain half scraping the pavement the rest of the way home was disconcerting at best. But the Safe T Plus failed to impress only because it was installed backwards. It made the coach nearly impossible to steer! When we got home and swapped ends on it, driving it was as different as night and day! One handed driving and no more white knuckles! After reading your review we are going to do the rear next. We made sure to take a factory tour while we were at Roadmaster, and if there’s one thing we kept hearing over and over it was about the extra steps they take to make sure their products are the best on the market and built to the highest standards. Not sure what would have caused your sway bar to fly out the back, maybe an improper install, but I watched the installer take the factory bar off and place the new bar on and I’m confident in the solution. The original Roadmaster steering stabilizer failed probably due to lack of maintenance for 10 years. But that said, when we got our used coach we hated how it wandered all over the road. I think these things that are basically shocks mounted horizontally can wear out. And ours did wear out since replacement with the Safe T Plus made a huge difference. It’s truly sad that an outfit like Camping World cannot install something properly. We had to buy a big socket to tighten it and a good friend and long time trucker said to re-torque it after 50 miles. We have not done the rear sway bar but it’s on the list. All I can say is it’s not going to be done at camping world. I’m no expert but I believe the secret of the big diesel ride is air bag suspension. I put one on the truck this summer and the upgrade was worth the expense. Not an easy install for the shade tree mechanic though. I’ve heard mixed things about the add on airbags, let us know how those work out for you. I can’t believe the difference! I shared your frustration with the way the transmission was down shifting on hills. I experienced exactly what you have been complaining about. My 2015 Phoenix Cruiser is build on a Ford E-450 chassis with a V-10 and 5 speed transmission. When we got to the FMCA Rally at Madison, WI this summer I visited the booth of 5 Star automotive and after lots of questions and answers they upgraded the programming in my engine computer with a solution. Out return trip home to Arizona was a delight. If you are close to Grants Pass, OR stop by Henderson Lineup as I know they offer the same solution. You won’t be disappointed. We are jealous yet again with all your new toys. I put on the “safety plus steering stabilizer” bar while driving across the plains myself and it made a noticeable difference. Seeing what you guys have added has us talking of another upgrade for Atreyu! BTW if you two aren’t too busy with work we’re currently in the Williamsburg area and would love to meet up. Thanks again for bending Fleetwood’s ear towards their actual consumers. Well done. We may be hanging around Williamsburg tomorrow afternoon/evening before our job starts on Monday! Shoot us a message on Facebook and if we’re out and about we may be able to connect. I just watched this video and started researching sway bars. I also have a 2016 bounder 33C. During the video you stated you had an F53 chassis. Roadmaster says the vin keeps coming back as an F550 chassis not an F53. I ran my own VIN on the internet and it came back as an F550 chassis. Can you please run your VIN to clarify what chassis you have? I’m beginning to think these Bounders are not on F53 chassis, they are on a F550 chassis. I was told by Fleetwood it’s an F53 chassis. I will email them and confirm. Thanks for checking. My contact at Fleetwood confirmed the Bounder is on the F-53 chassis. “Before it becomes a motorhome chassis, the vehicle starts out as a Ford F550 truck. Once converted to a motorhome chassis it becomes a F53 chassis, but the truck VIN doesn’t reflect this. If it is a class A motorhome with a VIN reading as 550, then it is an F53 chassis. I lived in Washington state for 30 years. Highways are good and taxes are high. 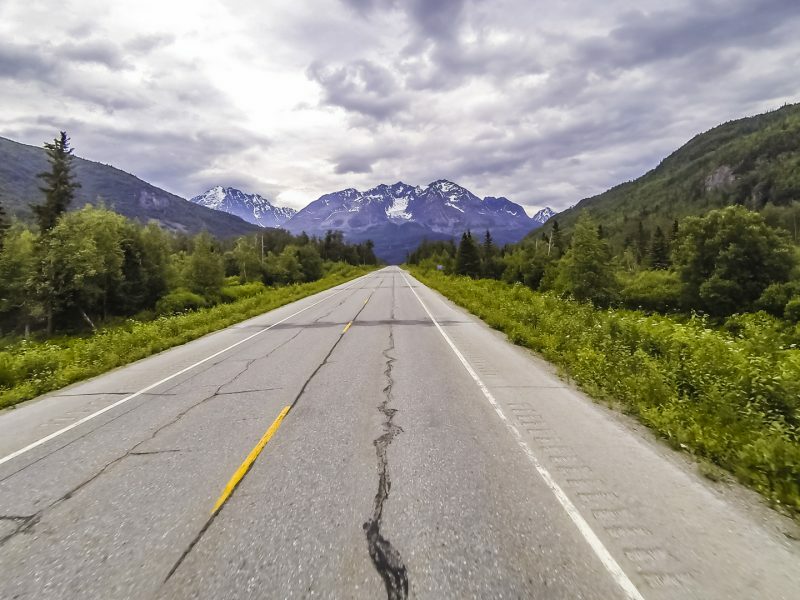 Was your rear tire repaired in Alaska and your windshield replaced in lower 48? What are your sources of income to pay for the RV stabilizers, fuel, food, etc? Great info, we just winterized our rig, 2016 Bounder 35K, and already can’t wait for spring in order to apply some of the suggestions from your video’s and get back out there. Keep it up we love your stuff. Thanks Michael, are you thinking about doing the install yourself? Yes, in the spring. The front replacement stabilizer and steering stabilizer should not be a big deal. The additional rear stabilizer I’ll need a hand with. You guys busy Come late April? How’s upstate NY sound? Want to experience “wander” then drive my 1997 Class B Roadtrek. At 62 mph, terror happens. Solution? We drive at 60 mph and are rewarded with 61mpg! I have tried several front-end soltiins, but perhaps a rear sway bar… It is a Dodge and Dodge products wander. Love the coach part of it. Great article. I hope you will continue to report on any improvements in ride and safety from these upgrades. I have the same chassis on my Winnebago Adventurer and have hit information overload trying to compare all the companies that manufacture these suspension and ride upgrades. My Roadtrek mileage is 17mpg. I don’t where that 60 came from? Tracy we will continue to report as we test. I can honestly say beginning with the rear sway bar might be your best option. I so enjoy your video’s. When we had our Holiday Rambler gas coach we had the same trouble, right down to the screws falling out from the dash!!!! While out west we stopped at Coburg for factory work. At that time it was Monaco. We were there for 5 weeks! While we were there we fell in love with the area! Met great people. All of our issues, at the time, were taken care in a timely fashion except for the replacement of a door and that’s what took so darn long. We enjoyed picking black berries across the street, making jelly!!! We now have a 42′ diesel pusher and couldn’t be happier. Thank you so much for your comments and video’s. You two are the best! Love the cats too. One interesting thing on the Ford F53 chassis is that the front stock sway-bar has two positions, and is usually setup in the furthest outward bolt-hole (as was your Bounder). If you simply move the links from the outward set of holes to the inward set of holes (any handy person with some basic tools can do this), you reduce the lever distance, and thereby increase the function of the sway-bar. Basically, for 0$, you can fix the front end in about 30 minutes yourself if you’re handy. Sounds like a neat trick! This might be the perfect option for those who are thinking of adding the rear sway bar alone! We installed a TracBar on our W-24 (2009 Outlaw) and it made a night and day difference. The best $400 we have probably spent on the RV. Every semi we used to pass was a “wag the tail of the dog” experience before the install. After install all passes are now rock solid, straight and we barely notice. It’s such an awesome feeling isn’t it? Now our Bounder drives a lot more like our Excursion did. I agree, I am probably going to do a rear track bar first as there is none back there and ford put one on the front from the factory a few years back, so it definitely not snake oil. Will probably try CHF first since it costs nothing and should stiffen the sway bars. Want to do a steering stabilizer but can’t decide which, Road Master, Safe T Plus or Trucenter. Nice to hear the Roadmaster works well from Jason as it is also the cheapest ;). BTW my new 6-speed seems much better on cruise control than the 5-speed based on the video having just done our first trip with it in our new Vista. Thanks for the update. Keeping in mind that we have a diesel pusher, the change we made to our ride by switching from Bilstein to Koni shocks was impressive. Don’t know if that would make as much difference for your rig, but the reason we took a chance and made the switch is because everything we read was that Bilsteins don’t hold a candle to Konis. That was our experience too. Forgot to mention…… we only switched the FRONT shocks, and it made a huge difference in ride stability and comfort. It sounds like a lot of rattleing and creeking sounds as you were going down the road? did this all come about from the Alaska trip? I am going to Alaska next year with my Monaco pusher that does not have a rattle in it right now and am afraid the trip is going to beat it up. 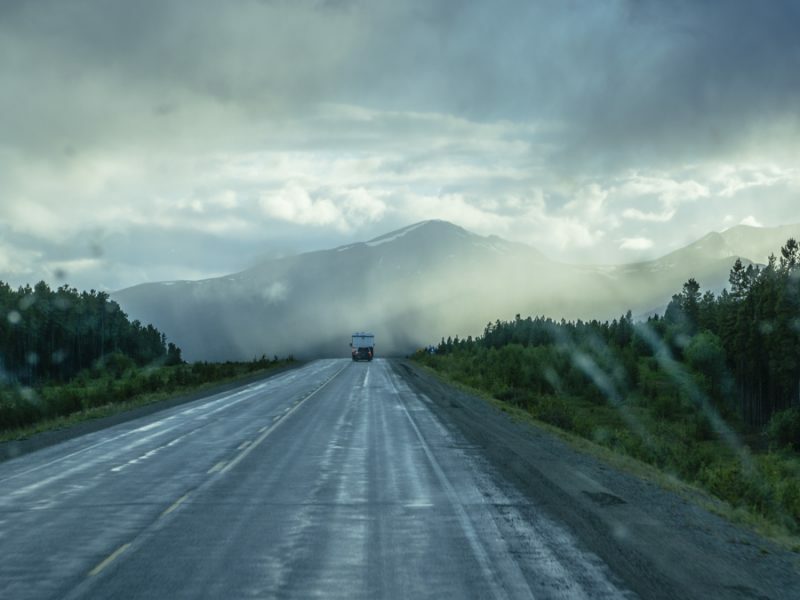 We took our rig on some of the worst roads in AK, if you stick to the main roads you’ll most likely be fine. Learned a lot from this video. But that down those hooks from above the drivers head space! A bounce and a knock and I envisioned a Midnight Express moment (the movie~maybe not to be seen). Thank you for being You Guys~love the time laps…wish some of our RV moments had that! I have am really anxious to install some sway bars on our Ford chassis gas RV, and after reading and watching your experience, now more than ever. But here’s what I just don’t understand: Why don’t they come from the factory with this gear?! If it’s that big of a difference, and everybody knows it, and if, as you so astutely alluded, Ford does any sort of legit R&D, why do these gas coaches still not have sway control as a standard? It just seems crazy. I’d guess the reason they don’t install better sway bars at the factory is cost. And it probably serves to differentiate the different model lines. Don’t like the ride of your gas coach? You should check out our diesel models! This is what we’re told: in comparison to the auto market the RV chassis sales are like a tiny drop of water in the ocean! Sadly, I don’t think there’s enough money for Ford to invest a lot of R&D into these chassis. 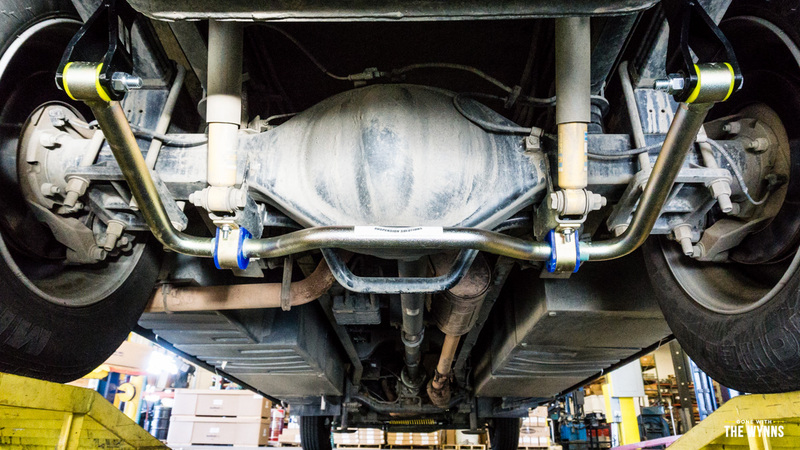 In general it has nothing to do with the RV mfr, they are not allowed to remove the factory sway bar as it will alter the chassis and thus the warranty. Wynn’s…you got it going on now. Well done. Now call Jerry at Sumo Springs at 866-898-0720. Let him recommend a set of these. I’m sure he will hook you up if you do a review. This will stop the up and down motion a lot!!! Don’t you wish you had all this stuff done before you went to Alaska?? We are totally kicking ourselves for not having it done before logging nearly 10,000 miles up and back from Alaska! All the Mods you did will improve the way the motor home handles. It won’t sway near as much, you won’t feel the trucks passing you as much either. However as far as improving the ride, the bumps etc. they won’t help much, which is obvious from listening to your video as you drive. I don’t think much will. I had an 07 Southwind on a Workhorse Chassis. I upgraded the shocks, sway bars, steering stabilizer, sumo springs…….and the ride was improved a little, but not much. Yes, it did help with the handling, but was a lot of money for the improvement I got. As you know, there’s nothing like a diesel pusher, although there are some diesel chassis’s that ride bad too. I currently have an 04 Revolution on a Freightliner Chassis and it rides and drives great. You mentioned about the cost of a gas vs diesel, if comparing year to year, yes there’s a big difference. This is my 3rd diesel, I’ve also had 3 gas motor homes. To me, I’d much rather take my budge and spend it on a older diesel then a newer gas. I bought my current diesel a year ago. It had 27,000 miles, always garage kept, new tires, new batteries, all LED lights, flat screen TVs and was in beautiful condition. I paid about 1/2 what a new Bounder gas motor home would be. I’m sorry to say, that theirs no magical solution to make a gas motor home ride and drive like a diesel motor home, not to mention the lack of noise in the diesel too. So when are you getting another diesel? Hi, I had a 50ft Ocean Yacht for 10 yrs, I was a live aboard and traveled extensively. I have many horror stories about my adventures, the last straw was being caught in 25 ft seas on my way to the Bahamas that came out of nowhere. I was lucky to survive that one although I had almost $100,000 in damages. Yachting is a very expensive and dangerous hobby, think this out carefully. Awesome update on the Gas RV ride, thanks again! Is there any way with your connections that you could find out why Ford doesn’t put those kind of improvements into the F53 chassis in the first place? They fit them with two sway bars already, why not give us what we need to have a good ride instead of having to upgrade? It really can be a white knuckle experience… Maybe the RV manufacturers might see this as what sets them apart from the other brands? We’re equally as un-impressed with the chassis, see my response to John above. I think everyone is on the same page. Thanks for the upgrade video. Really helpful stuff! Unrelated question… could you do a video sometime in the near future on your internet and tv systems in your coach? I saw one that you had done a good while back. Have you changed your systems in your new RV? Ah yes, we like that little guy as well. I’m sure it’d greatly benefit from these upgrades…the main concern is weight though so make sure you understand the OCCC. I don’t even have an RV, I felt like I went on a ride with you guys! Very COOL!! The Cat on the counter top or dash so wonderful! And the other stuff really interesting. Jason, You beat me to it !! My bounder is getting the front and rear sway bar and steering stabilizer as we speak. I pick it up Saturday and cant wait to drive it. I can say I also installed the 5star tuner and the drive to the shop to get the chassis mods was very pleasant. The shift and engine performance was quite a bit different, I have several hills around me (not mountains but good short grades) I had to really try to get it to downshift hard otherwise in cruise it shifted only one gear and came out of the shift very quickly ( 3200RPM was max I saw in cruise Mode) No disengaging and re-engaging the cruise. Very happy with the tuner and cant wait to feel the stability mods. Safe travels. Thanks for this. My husband has complained about the drive of our class A gas since we got it last year. In Sep. we had an alignment done and it improved measurably although I still feel the sway when I am driving. While we were at Winnebago ( a story in itself) several of the other people we met almost had us convinced to buy a diesel for the ride. But, we love this coach and don’t really want the expense. THIS sounds like the answer. We aren’t looking for perfection and we know once we head out west with the mountains we’ll still be driving more slowly than others but that’s the idea. We have a Workhorse chassis which of course is no longer made but many people have told us it’s great for longevity and this may just make us love it. Yes, I asked the tech about Workhorse and he said there are things that are better with the GM chassis vs. the Ford, but it too can benefit greatly with some of the same upgrades. We have the 18000# F53 chassis. The front and tears way bars have 2 settings on them and from the factory. They come set on the softest setting, to make the change is literally just moving the bolt and link to the hole closer to the main bar. Definitely a major improvement. I went a step further with adding a rear track bar, this bar will greatly reduce the front to rear sway you get when a semi approaches from the rear main,y but also from the front. You can purchase these or if you like to tinker and have some access to mainly a mill you can make your own for around $60. To purchase they are probably $700. The other thing I added were Sumo Maxim springs on the front, it is a polymer spring that mounts between the leaf spring/axle and the frame p. It attaches top and bottom and replaces the factory bump stop that comes from factory. This spring will smooth out the impact of bumps like the oh so famous lines that run across the road. They also help control sway. The entire package made our coach soooo much more enjoyable, we no lon per fight sway from passing vehicles. Now if you are talking about cross winds, that is a whole new story. The vehicle will handle better tha without the mods but it can still be a handful depending on the strength of the wind. We’ve got the SUMO on “the List” now!